UPDATE: WEEP – OKAY WE GOT CARRIED AWAY WITH THIS ONE. IT’S ALL AN APRIL FOOLS, BUT WE’RE JUST SAYING, IF ANYONE OUT THERE WANTS TO MAKE ONE, WE’LL REALLY LOVE IT. We know. Those shiny Jesus gadgets are still holed up in the US and don’t look like they’re making their way over the Atlantic in a hurry – the end of May looks like a likely arrival date now – but just so you are fully prepared for its possibilities when the iPad does arrive in tye UK, take a look at the best iPad dock ever. 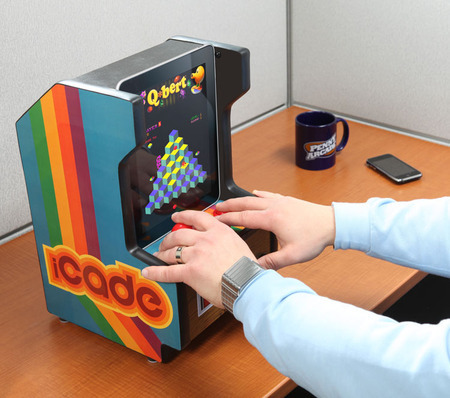 From the fertile geeky minds of ThinkGeek comes the iPad Arcade Cabinet: a lovely mixture of pure retro glory and a practical device – it has a 10 pin port which connects the Pad to fully operational arcade controls, two 2.1 dolby speakers and a USB power adaptor that means you can charge it up from any sort of power source. That retro design is seriously cute – it’s wood! it’s got an arcade stick that actually works! and those single player, double player buttons work too! We are SOLD. 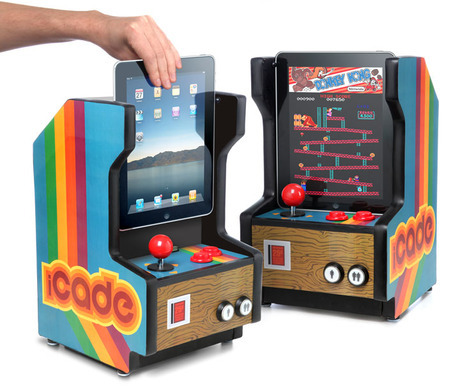 Use the iCade app (should be on sale soon) to play several different traditional arcade games from Donkey Kong to Space Invaders. They’re selling it for $149.99 and we bet if you order it now, it will arrive before the iPad. Um…you are aware this was an April Fools’ Joke? and there isn’t anything real about this product.